I quietly crept out of the caravan, leaving a ‘thank you’ note to Elaine and Roley, but was greeted to a dank and misty morning. The 14km trek out to the Head had a mighty sting in its tail…..both a headwind and a 20% kick upwards at the end…..but I was treated to a free coffee by a mobile coffee stall perched on the top of the hill. a name that is well known to insomniacs who hear either, or both, of the shipping forecasts at 00.45 and 05.20 on BBC Radio 4. In the morning sea fret, it had a sense of drama all its own. Even so early in the morning, a steady flow of people had begun to arrive, some on motorbikes, others in cars, to spend a fleeting few moments, take a “I woz ‘ere” photo, and scurry off to their next destination. Notable by their absence all along my route from the south were other trekking cyclists like myself. 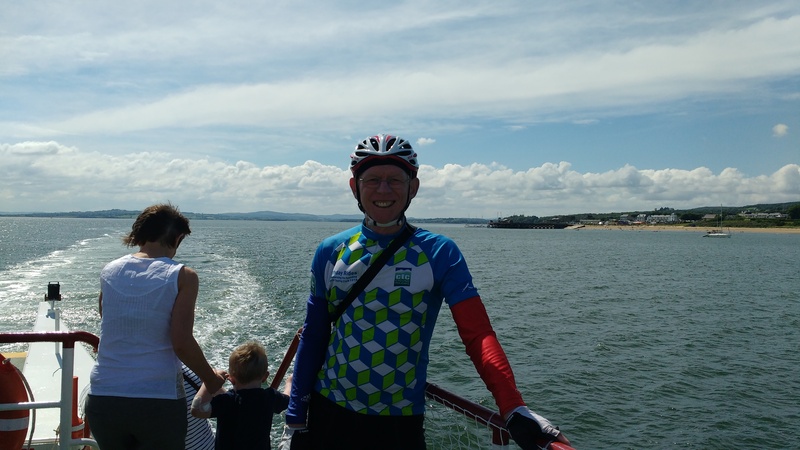 Unfortunately, the MizMal route is primarily seen as a classic charity ride, taking the shortest and least interesting route across the heart of the country. When I met people who proudly said they too had ridden the MizMal, I was always disappointed to discover it was invariably with a fully supported charity ride. 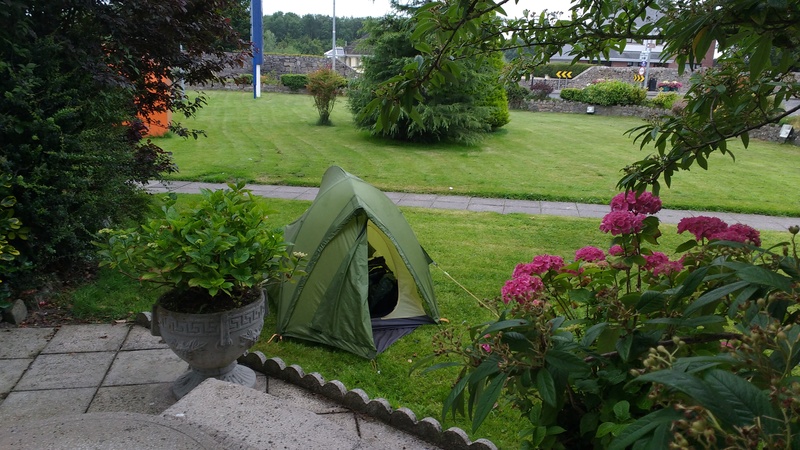 Doesn’t Ireland have any unsupported adventurers who carry their own stuff and sleep in a tent? So, now in Derry (Londonderry) to unwind, box the bike for the flight, and spend a few days discovering the fascinating but disturbing past of this troubled community. And the only indication that I was crossing the political border of NI was this sign telling me that kms were changing to miles. I wonder if that will change with Brexit…..? I told Bernard, my camping pitch benefactor, that when he drew back the curtains in the morning he wouldn’t see me. As I crept away at 6.30, he wouldn’t have seen me anyway…..his bedroom was at the back. and ‘unprone’ as I am to taking selfies, I couldn’t pass up the opportunity of catching a glimpse of my own profile in one of those traffic exit mirrors at the end of a drive…. 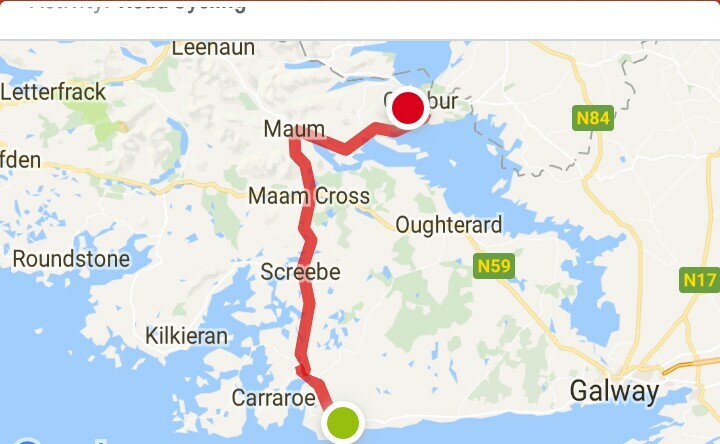 and then onwards forging a direct route to Malin village across Inishowen, just 14km short of my destination at Malin Head. and they offered me their spare caravan for the night, and Eileen prepared me a chicken salad for supper. It is the fate of the solo traveller to have to accept such spontaneous acts of kindness. If the BBC weather app is telling the truth, I will arrive at Malin Head, just 14km to the north, tomorrow when it is bathed in unbroken sunshine….so what of this mythical spot which is a star of the shipping forecast and famous for its stormy bad temper? Was I glad I had left the climb over the Pass of Glengesh till this morning…..the conditions were perfect and the views from the summit had me lingering overlong chatting to a young couple who also couldn’t tear themselves away. They told me of their dream to walk the Camino in Spain, and I told them of the more ancient route along the north coast. The descent from the pass was so steep, with tight switchbacks, that I thought the bike was going to run away with me. So glad I was only carrying 9kg of kit. The heavily loaded tourist might have had to walk down…….unless of course he had discs. 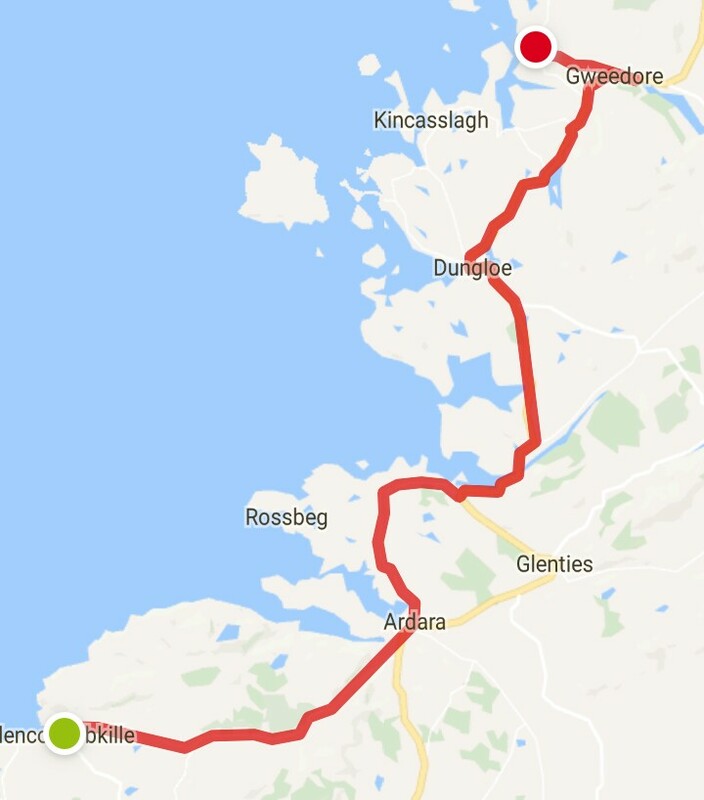 Once down into Ardara, it was breakfast time, which stoked me up for a longer stretch to Dungloe. Along the way I passed this team of men gathering in the dried turf, which in this country is used as, and sold for, winter fuel. You can still see the odd homesteader cutting his own turves by hand, continuing a tradition that is centuries old. 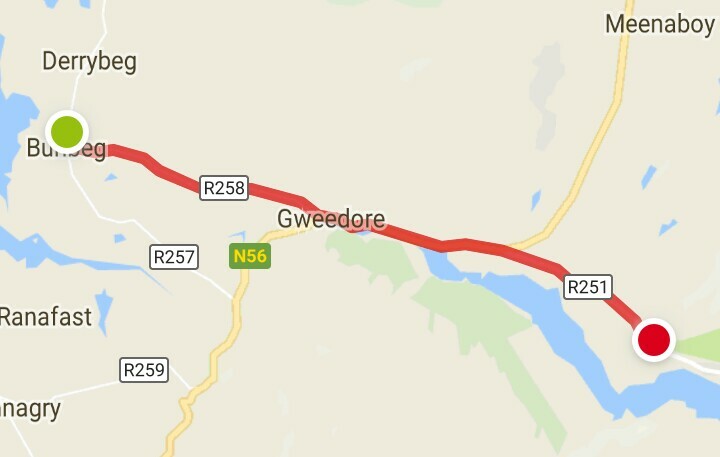 I chose to stop for the night at Gweedore simply because I liked the sound of the name. Something straight out of Harry Potter……and when I was told a good spot for camping would be down by the beach in the grounds of an abandoned hotel, I took one look at the site and knew I would have visitations from spectres during the night, so I asked a local if I could pitch on a patch of grass opposite his house. “Excuse me, do you own that patch of grass across the road”. “Maybe I do, maybe I don’t. Why, what you have in mind? To cut it for me?”. This wasn’t going well. “May I pitch my tent for the night?”. “Course you can. Is that all? Where you ridin’ from”. When I told him, this is how he reacted: “Jeez, that’s a fecking long way…..just look at yuh, carryin’ no weight at all”….and I thought he was referring to my luggage, but he said it while patting his own considerable girth. “Suppose yuh want a shower then……”. And when I stepped out of my tent this morning, this is what I saw…..looking down on the abandoned hotel on the right. The morning brought a promise of decent weather but strong winds…..the reality was rather different: I had to wait out heavy rain before getting started, and dodge the showers as they occurred. 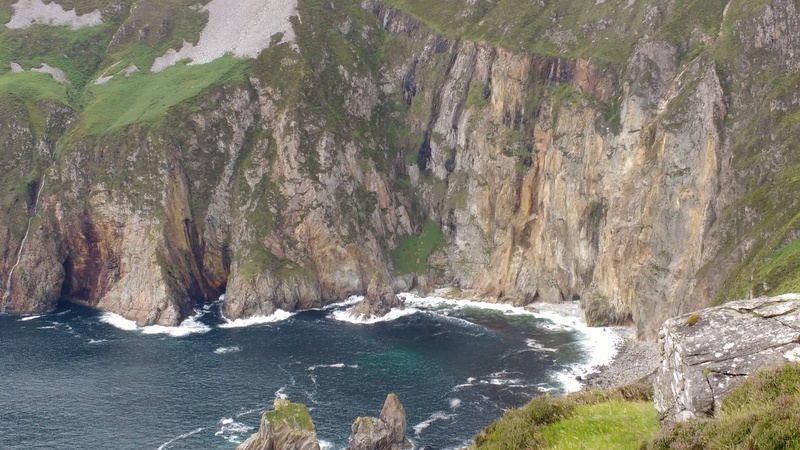 However, heading due west to take in the dramatic cliffs of Slieve League, the northeasterly wind helped me over the numerous climbs, heading towards yet another remote corner of Ireland where Irish is still the working language. The Slieve League cliffs have all the drama of the Cliffs of Moher, but without the crowds. They are too distant from anywhere, and they haven’t yet built the critical visitor’s centre that draws in the tour buses, and hence the huge crowds. 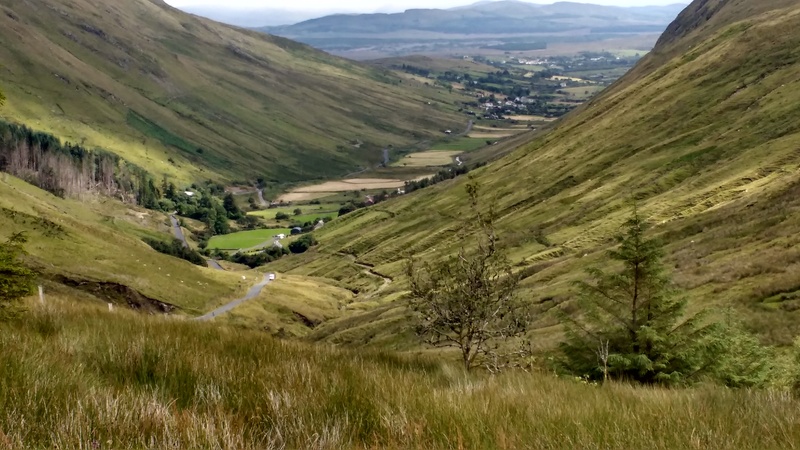 When I got to Glencolumbkille, situated right out on the edge of the peninsula, I’d run out of steam, and the thought of turning into the wind to climb over a challenging pass to get to Ardara (stress on final vowel, btw) suddenly lost its charm. Decision made, I looked for a pitch, and the landlord of a local pub kindly allowed me to hunker down on a patch of grass in his car park. 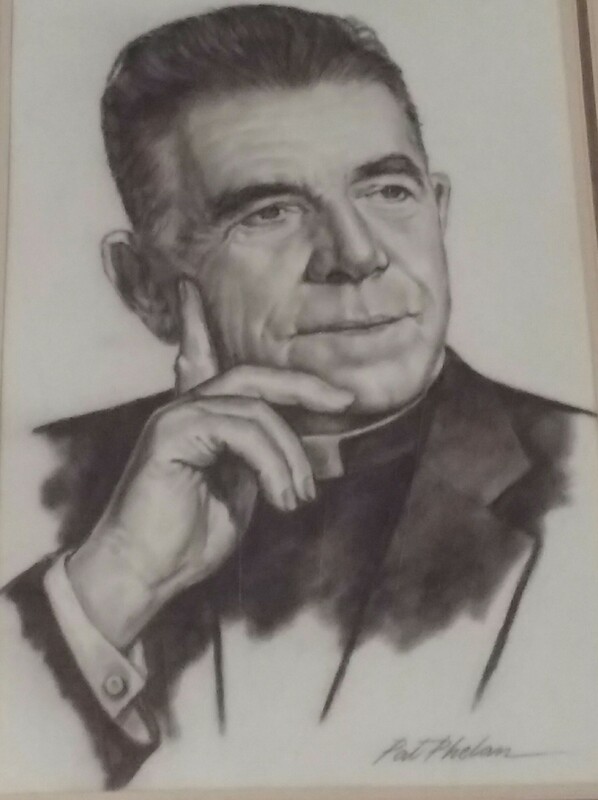 in 1951 who decided he had to do something to stem the flow, and he set about building the folk village (a museum of local life), and fighting vigorously for investment in the infrastructure of the area. His success has made him a legend in these parts, so now I get the opportunity to spend the night in this very special place, where the community is scattered widely across the valley, and the air frequently resounds with the sound of tumbling water as streams come crashing down from the heights. Although this is meant to be down time from the bike, there were a couple of out-of-town visits I had to make, and one was to a cemetery in the tiny village of Letterbarrow up in the Blue Stack hills. You see, it was exactly 50 years ago, almost to the day, that I arrived in Letterbarrow with John and Pat (two class mates), only to discover that John’s great grandmother had died, at the age of 101. Anecdotally, I seem to remember something about her having a fall from a bicycle…..but that could have been just another good old Irish story fuelled by the Guinness. Anyway, I had my very first taste of an Irish wake where the body was laid out in the living room and people filed through the house continuously to pay their respects, and then stopped to have a drink and a chat. And this seemed to go on for a couple of days……and the supply of drink was endless. As I stood by Annie Kerrigan’s grave in 2017, life really had come full circle, dragging back into my memory space so many forgotten things. Randomly, and nothing to do with Annie’s death, I remember how embarrassingly easy it had been to hitch hike in Northern Ireland in 1967, the year before the outbreak of the troubles. 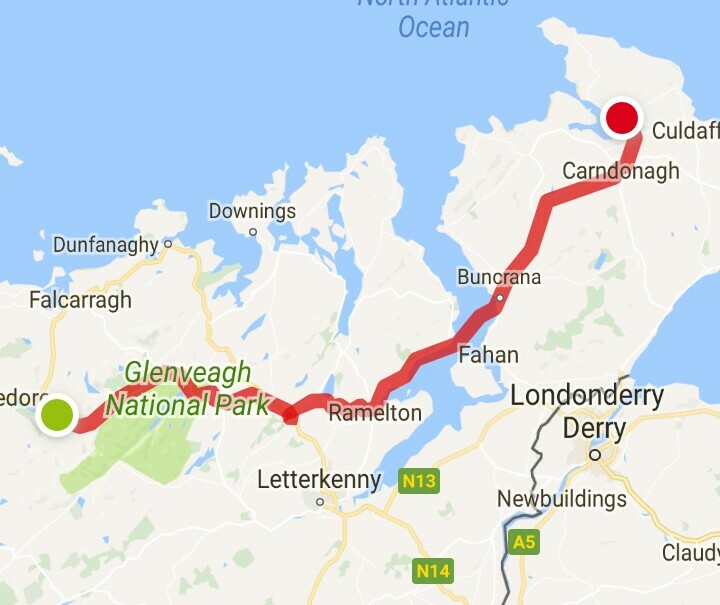 And as I cycled up to Donegal yesterday, I passed through a narrow bottleneck of land only 8km wide where the NI border almost meets the Atlantic. The proximity of NI is also corroborated by the accent in these parts….to me it is almost indistinguishable from the harsher tones and inflections of the six counties. Donegal itself is a very small town, but it seemed to be under siege with Spanish and German tourists…..many of whom I encountered on my visit to the medieval castle. Serendipities happen aplenty on a journey like this, and they go far beyond discovering what is round the next bend or over the next summit. They abound in the people you meet along the way who have fashioned an extraordinary existence for themselves, overcoming many obstacles in search of their dream. 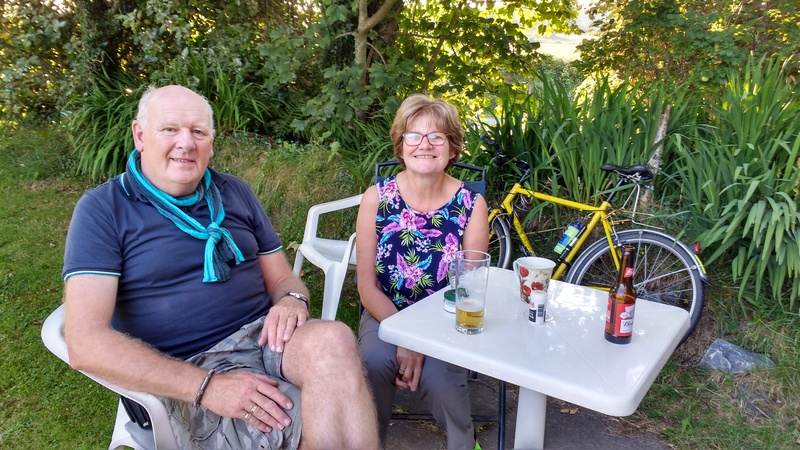 Rob and Mairead, both passionate about their cycling and walking, are also dedicated organic homesteaders, and I was privileged to be able to overnight at their house, sample the fruits of their organic labours, and share stories of the road. Like us, they are enthusiastic tandemists, and I was impressed to discover that their bespoke-built Thorn tandem was the same colour as the Dave Yates I am currently riding……in fact, it was from an advert of the yellow Thorn that I got the idea to have my new frame sprayed yellow. When cycling through a country, it is one thing to discover its physical geography and its architectural and artistic beauty, but it is quite another thing to discover the people that live behind the frontages of the thousands of dwellings you pass along the way. I have been very fortunate to meet people like Rob and Mairead who have afforded me a glimpse of Irish life behind the scenes. And the many glimpses I’ve had during this trip have defied all of the stereotypes I’ve carried around in my head for years about Ireland and its people. and he is now buried in Drumcliff, just 20km north, having been exhumed from his first place of burial in Paris. Some have serious doubts that they actually transferred his body, and not that of a neighbour in the cemetery. and the mother of Bram Stoker, the infamous creator of Dracula, had also been born here and, unusually, survived a major cholera epidemic in which most of the local population perished. In fact, the name Dracula is said to have been coined by Bram from two Irish words meaning ‘bad blood’….so scotch the idea that it is a Transylvanian name. Today has been an opportunity to give the legs a bit of a rest ( but not much) and spend time in this fascinating city, but the soporific heat has made me feel a bit lethargic and lacking in energy. But I came to with a smile when I noticed this sign outside a solicitor’s office……surely not…….Argue and Phibbs? along narrow farm roads that had ‘lawn’ growing along the middle (a clear indicator of remoteness). Following the folds of the Ox Mountains, the enthusiasm I had for the frequent descents was dampened by the infuriating consequences…..dozens of sharp climbs (damn it)….and this went on for 30km. Amazingly (and I myself was truly amazed), I ended up where I intended. 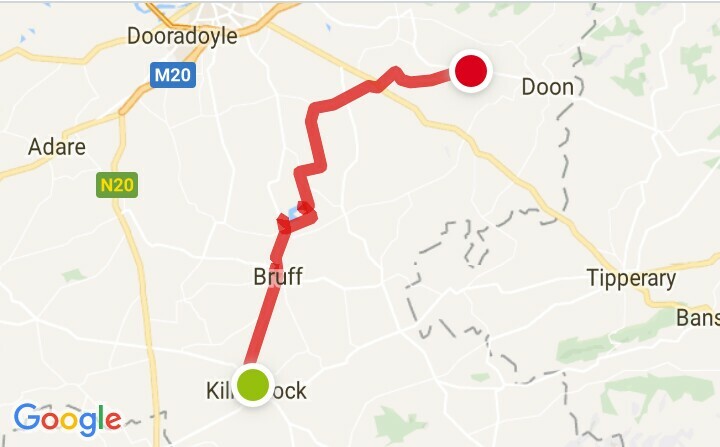 10km from Sligo, I decided to call it a day, hot sticky and tired, when Henry (a retired Garda) passed on his bike with his 2 grandsons. When I enquired about a pitch for my tent, he said: “Sure, I know just the place for you. 3km further on, there’s a field by a river, and a pub (now closed) across the road…..well, it’s their field. They’re a retired couple. Knock on their door and just say Henry sent you”. Which I did…..got a warm reception….no problem about camping. The horses weren’t in the field at the moment, but the grass was long….waiting for silage harvest. Moral: the unplanned can produce the best experiences in life…….and the hardest. Last night I had a stopover with an extraordinary couple in an extraordinary location. 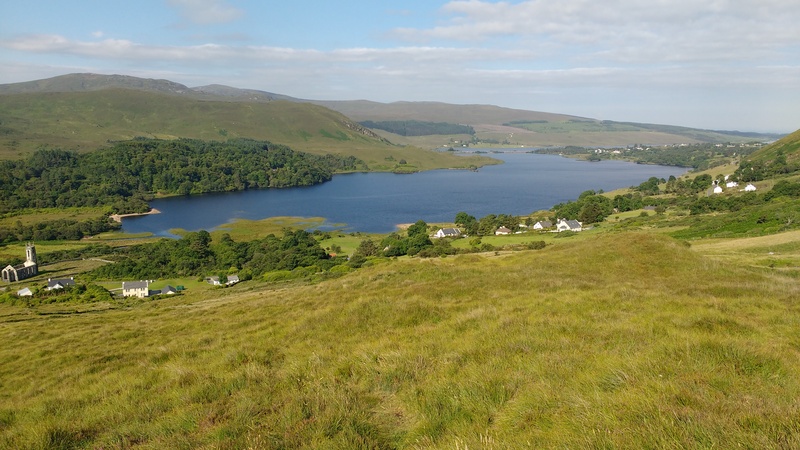 Ed and Anya work from their home, overlooking Lough Mask, for a Falconry association, which means travelling around the world attending, and organising, events. Two days after my stay, they were off to Brussels for three weeks. Their house is a traditional Connemara cottage, high on the hillside, surrounded by grazing sheep. During supper, I sampled both their homemade elderflower champagne and nettle wine. Surrounded by nature, they were feeding themselves directly with the fruits of the countryside…..and I spied a Richard Mabey book on the table, the late guru of the environment and harvesting the fruits of nature. 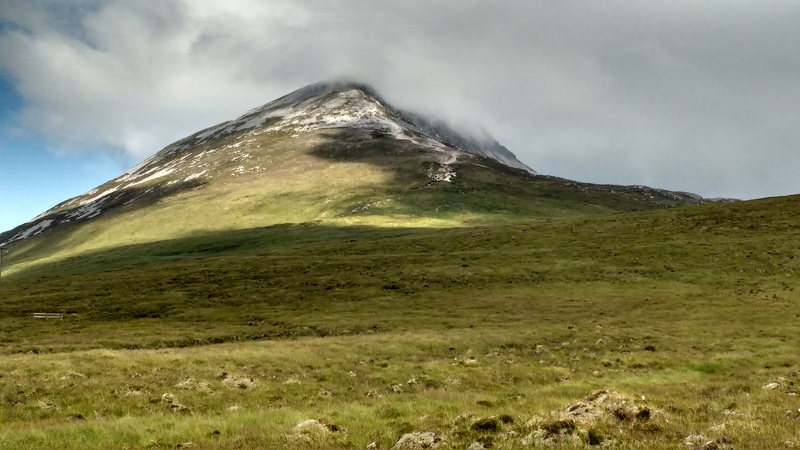 but I also wanted to make a nodding acquaintance with Croagh Patrick, the mountain where the legendary St Patrick was supposed to have driven all the snakes out of Ireland, and where today people troupe up on pilgrimage in search of indulgences….. reputedly, 25,000 climb it on the last Sunday of July to attend mass and confession on the summit. The logistics of the whole thing are simply mind-boggling, not to mention the provision of refreshments and loos. I mean, the whole event will last about 6 hours, so where do that many people go for a pee (not to mention the other more serious business). a ship bedecked with the skeletons of starved victims, representing the one million deaths due to disease and hunger. 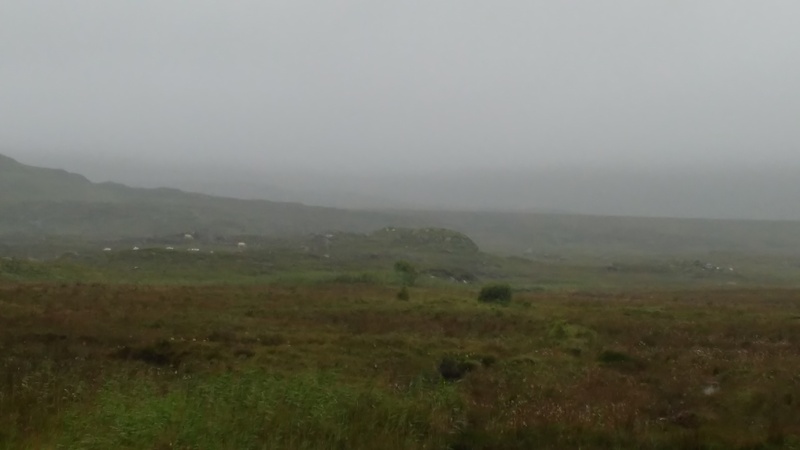 At the end of yesterday’s ride, I got caught in a Connemara squally downpour, and arrived at my Warmshowers stopover completely drenched. Kate, my host, totally unperturbed by my sodden state, greeted me with a hot drink and chocolate biscuit, introduced me to Valentin, her German AirB&B guest, and showed me the shower. 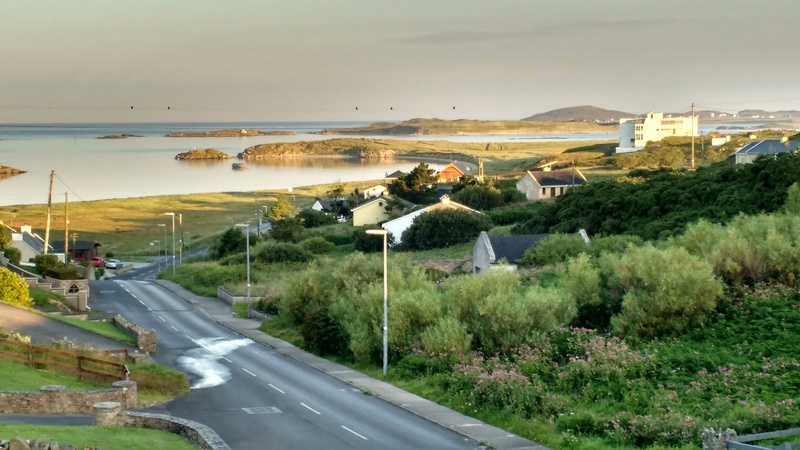 In the heartland of Gaelic-speaking Ireland, I listened to Kate chatting to her 3 year old daughter in Irish, a language that had been her only toungue growing up on a remote Connemara island. She had only learned English when she started going to school at the age of 7. Now she is fluent in several languages. 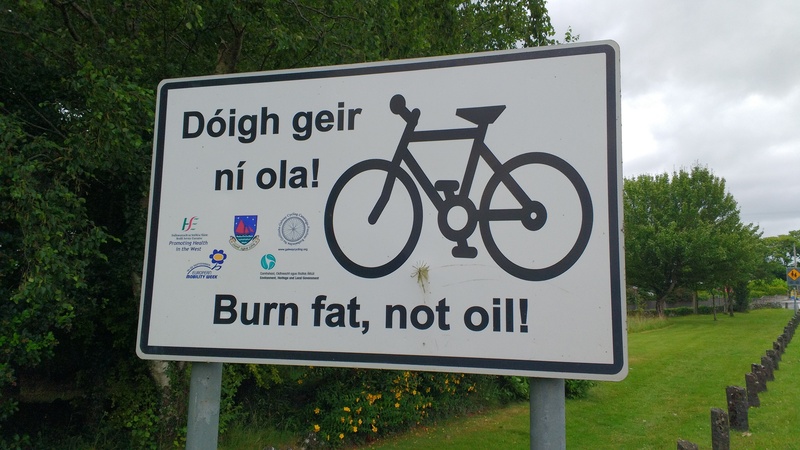 Many of the roadsigns and advertising boards are written only in Irish in these parts, and the people I mixed with in shops and pubs were all speaking their native tongue…..but it is threatened by the invasiveness of English. 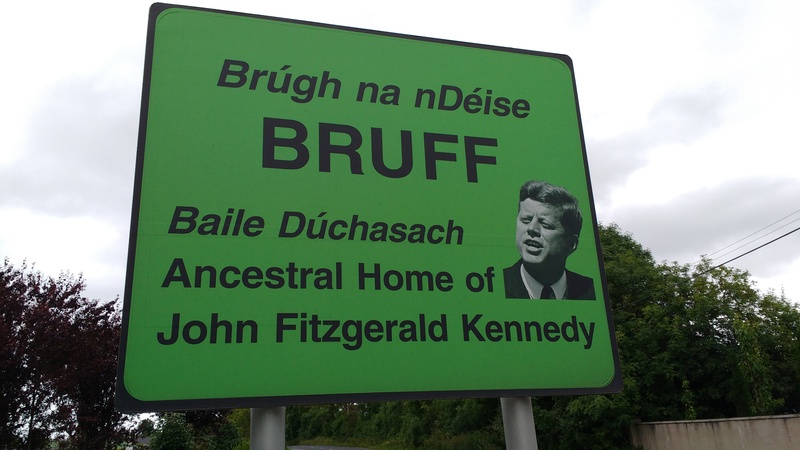 Simply teaching it in schools is not going preserve Irish as a working language. As few as 77,000 (2% of the population) speak the language, mostly in remote corners of the west, but importantly, non of them are monoglot….meaning they all speak fluent English as well. This could spell disaster for the local vernacular. 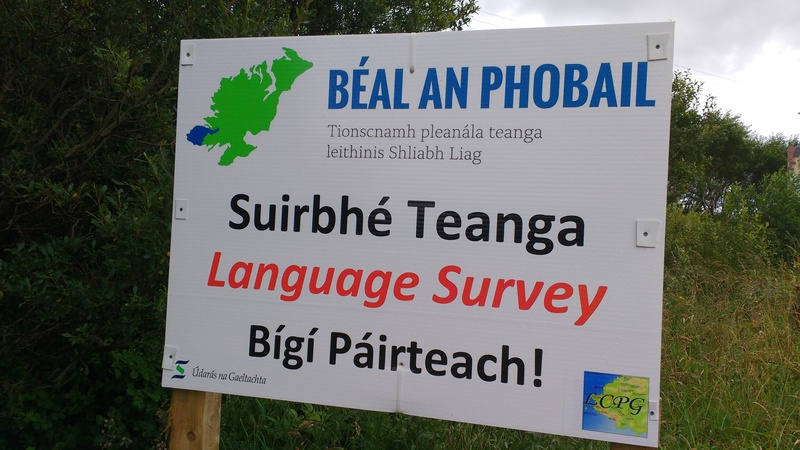 Ireland seems to be the only country in Europe where they have adopted a foreign language as their lingua franca. 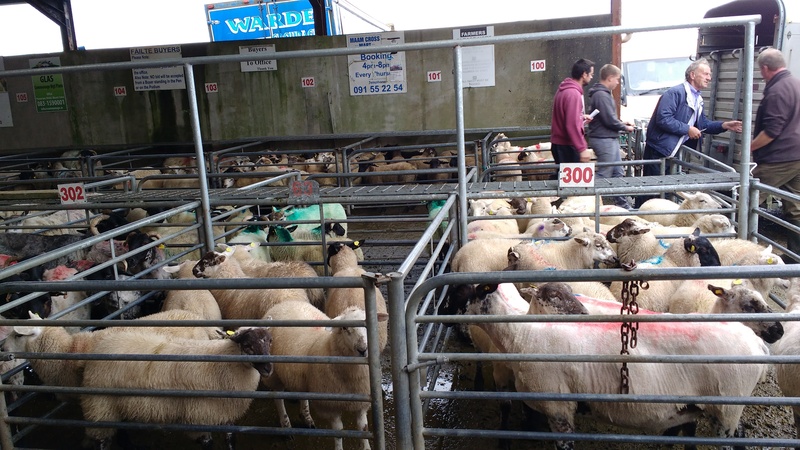 and curious about the sheep auction at Maam Cross, where farmers were everywhere with their Land rovers and trailers, a local farmer tried to sell me a couple of his lambs left over from the auction….tie ’em to the back of the boike, he suggested. ‘Tis good Oirish lamb after all. Today has been a long hard day ‘at the office’, crossing the huge limestone plateau of the Burren, which is festooned with standing stones and other evidence of ancient civilizations, and underpinned by vast networks of caves. 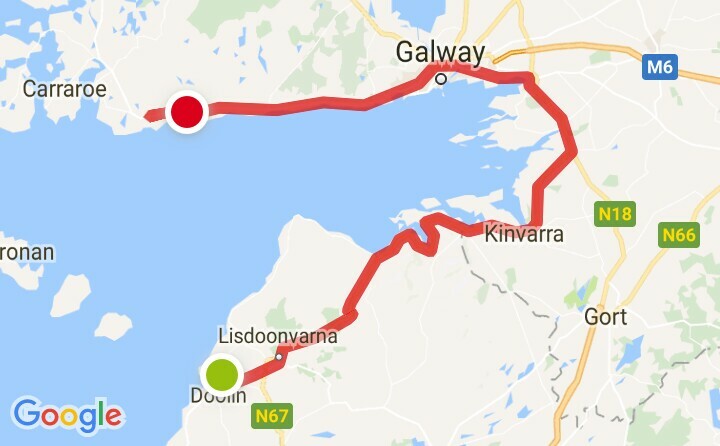 A huge chunk of the day’s riding was sweeping around the enormous Bay of Galway, and there were times (especially during the last 40km against a furious headwind) when I cursed the lack of a convenient ferry across the bay, so as to cut out the huge detour for likes of people like me. Anyway, given that the WiFi reception everywhere on the Burren has been ‘pants’ over the last few days, there were several photos I was unable to upload in the last two posts, so here’s a selection, some of which might amuse you. 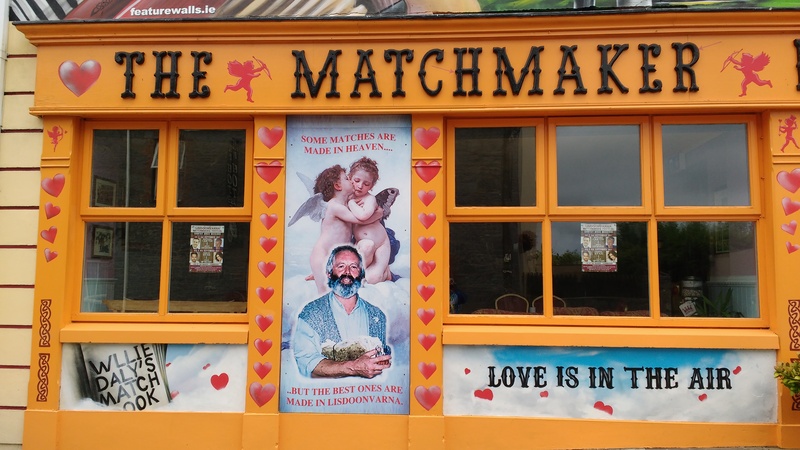 The Matchmaker pub in Lisdoonvarna encapsulates some of the town’s heritage. 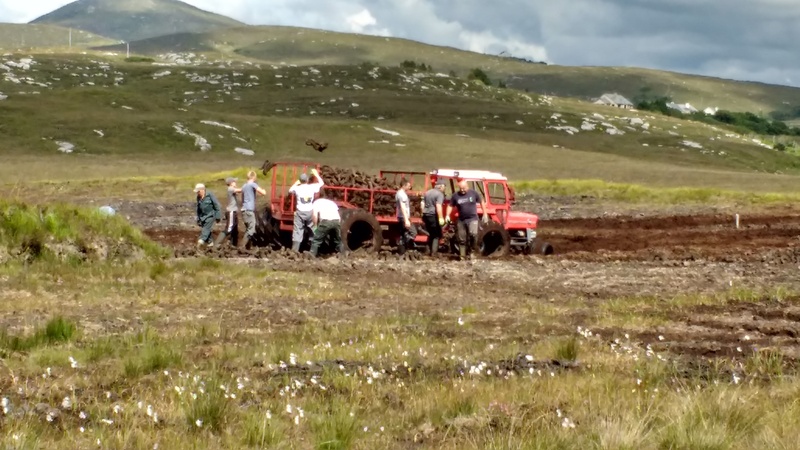 It is (and has been for many years) the matchmaking capital of Ireland when, in September, unmarried farmers would come from their remote rural locations to the matchmaking festival to find a bride. Quaint, I know, but that’s how they do such things in Ireland. 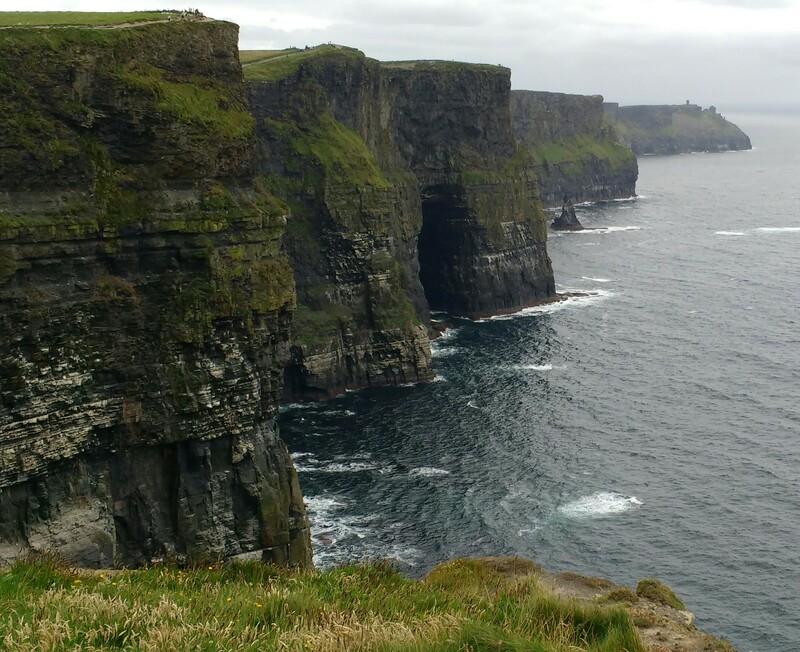 The Cliffs of Moher on the wild Atlantic coast….the most visited natural attraction in Ireland. Simply stunning….. Most of the aches and pains from the fall from grace yesterday were, thankfully, in recession…only to be replaced by the trial of a head wind all day. Well, I did have to go from east to west, didn’t I, and even amateur meteorologists like me know that prevailing winds in these parts come from the west……but, sometimes we simply have to pay the price. Nick and Anne were excellent hosts last night. Conversation over the table flowed till I had to excuse myself and crawl into my sleeping bag in the cabin. I emerged ready for breakfast the next morning as Anne was heading off for her shift as a nurse at Limerick hospital. Nick had formerly worked as an architect until the the crash of the construction industry in 2008….now he turns his hand in a number of artistic areas to earn a crust. I headed out to the Cliffs of Moher, the most visited natural attraction in Ireland, so had to expect to be joining the masses to see this extraordinary sight. Cliffs rise out of the sea for over 200 metres, and stretch for over 5 miles (8km), most of which is visible land side. Whatever you see on the internet, or in photos, being physically present and seeing them for yourself is something very special. The most important 24 hours of the trip….catching up with 5 of my 6 first cousins in Co Limerick. The genetic connections are re-established, gaps in family history are being gradually filled in, new developments in the lives of offspring are revealed, and the all important visits to family graves are completed. The very stuff of family life. I came away from Cappamore in beautiful sunshine to head for Limerick city, but a metaphorical cloud dimmed its rays when I miscalculated my distance from a kerb as I came off a roundabout. No sooner had I hit the deck when a young lady cyclist rushed to my assistance, and two drivers stopped to check me out. I ventured into a roadside pharmacy where a young lady pharmacist tended to my road rash, checked out other bumps and bruises, and soothed me with her soft Limerick brogue. 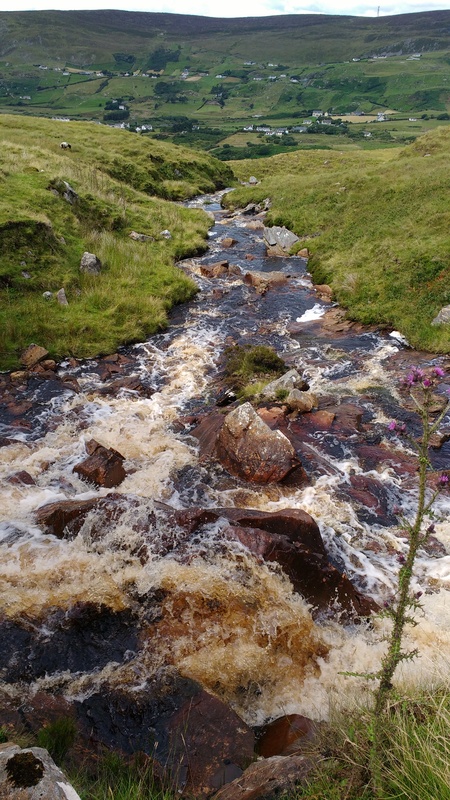 Almost worth falling off the bike for….. Limerick is the 4th largest city in Ireland, and has been a hotbed of resistance to English rule for centuries, and many key figures of the revolution came out of her, including Eamonn de Valera. So it came as a surprise to find that it had the oldest, and the most beautifully preserved, Church of Ireland (formerly Anglican) cathedrals in the whole country. Despite generations of animosity between the two religions, they now co-exist peacefully side by side, even though they may not be buried side by side in the cemeteries. And every town or city likes to pay homage to its celebrity sons and daughters. If you didn’t already know it, Terry Wogan was a Limerick man, and they have placed a bronze statue of the man prominently by the river. “Yes sir, how can I help?”. “May I camp for the night on your lawn? I promise not to leave any mess”. “Ah, so now tell me, where would you be from?”. “From near Cambridge”. “Ah, so just from across the water, then”. “But both my parents have roots here in Ireland”. “Ah well, you are indeed most welcome then…..”. 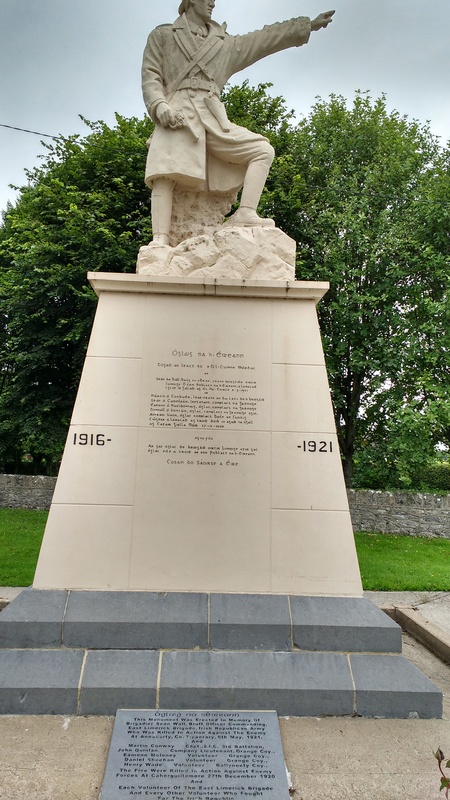 When I arrived in Kilmallock, I never realised this small village of just 1500 people had so much history. It has an Abbey, a Collegiate church, town walls and gates, and even its own castle, and some of its housing dates from the 1400s. But all to be undone by Henry VIII and the dissolution of the monasteries. …and monuments like this demonstrate the pride still held for their revolutionary heroes in the wars for independence. 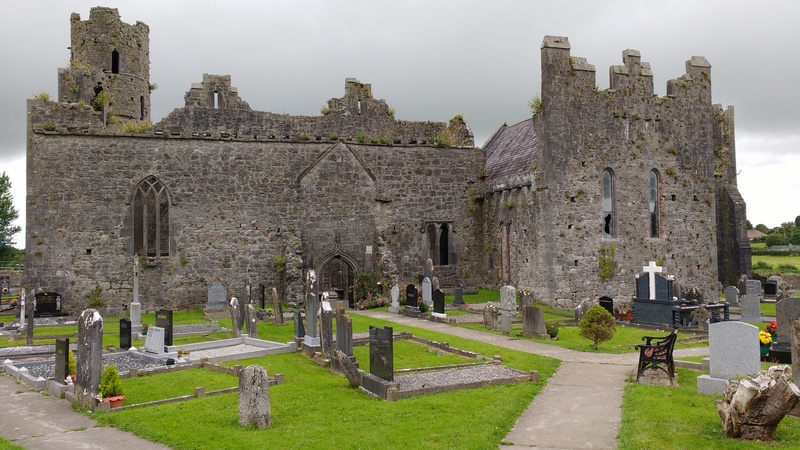 And so to Cappamore, seat of the O’Connell ancestral home, to spend a few days amongst cousins, and catch up with the last 25 years of family history. A day when I just put in the miles is what I call ‘a routine day at the office’. I’m heading towards the interior for no other reason than to spend a couple of days with my cousins in Co Limerick. It’s 25 years since my last visit, and then it was to bring my mother back to her place of birth, her last visit before she died. Of course, we didn’t realize that at the time…. now occupied by graves, one of which was this stark reminder of the levels of infant and child mortality, even in the 20th century. In the late afternoon, with rain setting in, I was tempted to find a room, but the average price of £100 quickly brought me back to my senses. 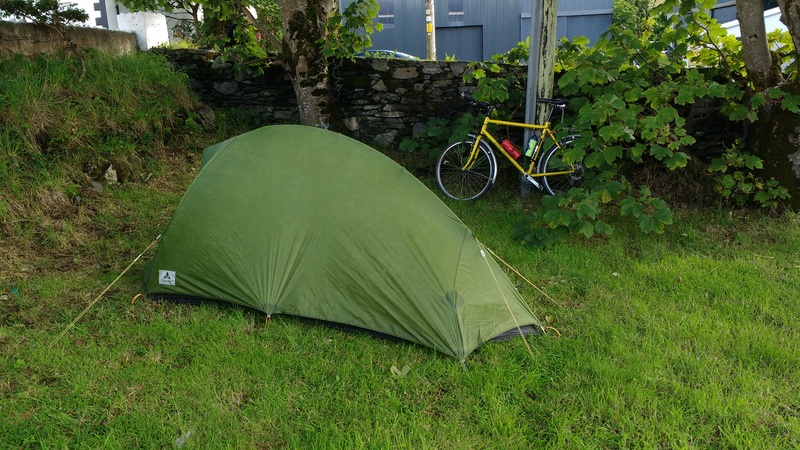 So I kept riding until I found a bit of manicured lawn belonging to a petrol station, and the owner, a man called JJ, graciously let me pitch my tent. So I am now savouring a pint of Murphy’s while I tap in this post……wondering how else I would rather spend the evening….. 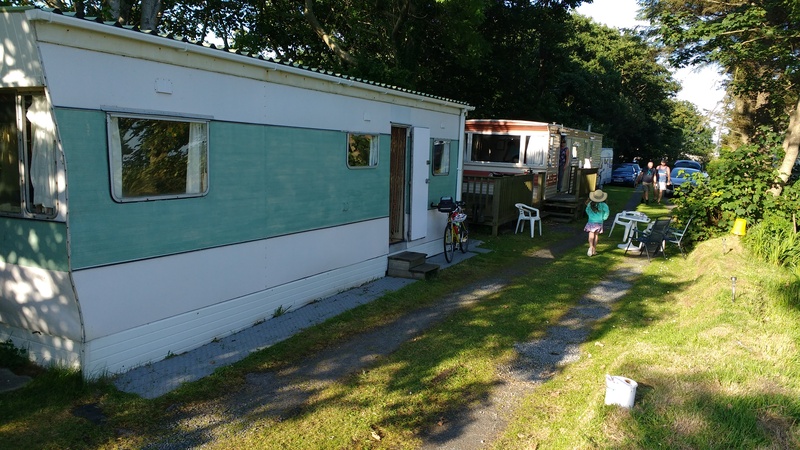 I got to the village of Sneem, on the Ring of Kerry, very early because I had decamped at 6am, to vacate my little hideaway in the grounds of a rural community centre. So early, in fact, that the only place open for a breakfast was the bakery. As I entered, I heard: “Are you in favour of the Cambridge scientific view of the world, or the Oxford theological?”. I looked at him quizzically and he followed me into the shop, plying me with questions about philology and philosophy, then abstruse areas of science, and the shop owner quickly came to the rescue: “Now sir, would you prefer to be left in peace? Sean, can I have a quiet word round the back?”. I then realized I was in the company of the village savant, who forced himself on anyone who would listen…….and I had been his first victim that morning. I then enjoyed my breakfast roll chatting to the 2nd Welshman I’d met who had moved permanently to Ireland. There was a lot of huffing and puffing on today’s route….I seemed to spend most of the day climbing first up the 1000 feet to Moll’s Gap (named after a lady who kept a little tearoom at the top), and then the murderous switchbacks of the Gap of Dunloe, which was also thick with walkers and horse buggies. If you really didn’t want to expend energy, you could pay 100 euros and take a buggy…..but for the other road users, they simply blocked the roads, making fast descents a bit tricky. 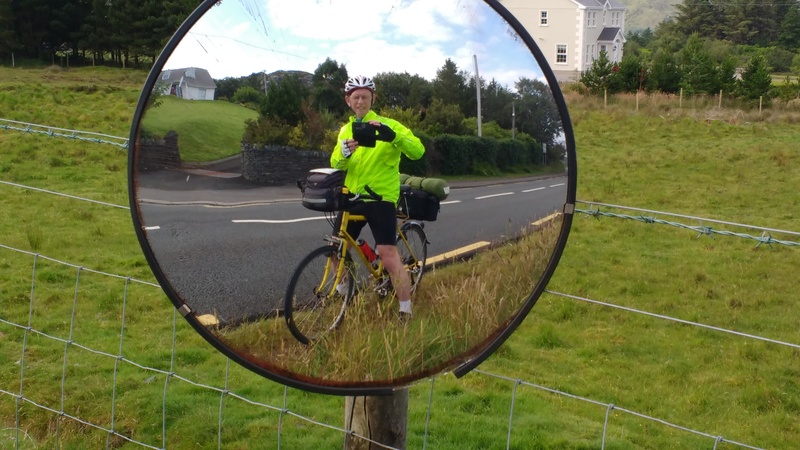 In Sneem, I found a cycle shop that must have been owned by a distant relative….it had ‘open’ on the door, but it was resolutely closed…and I was told he may not turn up at all…..at all…. 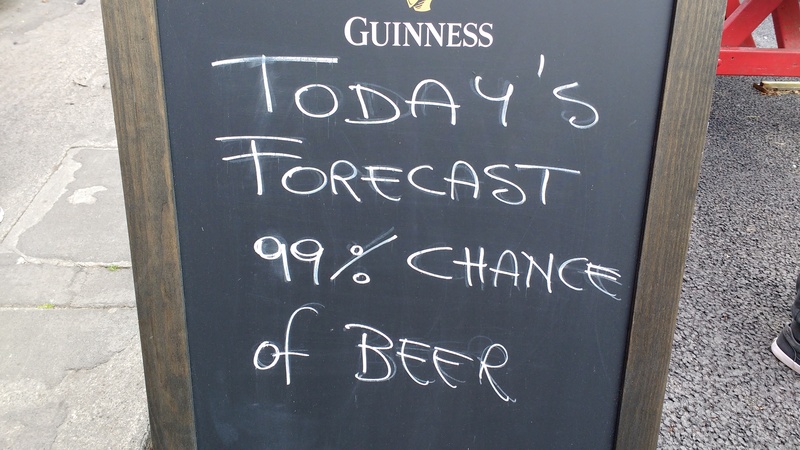 only in Ireland! “Now, what would yer be doin’ roiding a ting loike that?”, pointing to my bike “yer wouldn’t be ridin’ it some bejesus long distance, would yer?” When I tell him he retorts: “Feck, what would be doin’ that for, would yer kindly tell me?”. Just one of many similar encounters I’ve had in just two days. I can’t stop for a rest without being approached by someone…. and did 30 minutes of yoga stretches overlooking the sea. This ancient megalith has been around for more than 4000 years, so I spent the night communing with our ancient ancestors. 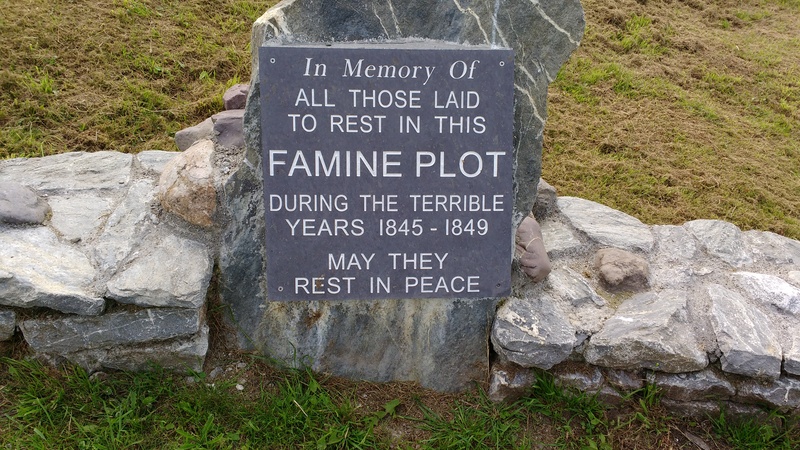 My route took me through Bantry, the scene of attempted invasions from Catholic Europe to rescue these Catholic lands, then over a 7km climb out of Glengariff that provided stunning views of the valley and Bantry bay, and onto Kenmare, where I discovered this memorial in the cemetery, commemorating the deaths of 5000 of the locals during the dreadful famine in the 19th century. My father’s ancestors had escaped the famine by emigrating to Cumbria from Co. Wicklow just a few years before, in 1840. Without mincing words, the British were responsible for genocide on a massive scale. But have we ever acknowledged it…..? Route planning is always a pleasingly creative process, and the process continues into, and through, the ride itself. A combination of deciding on possible destinations, diversions to see sites of special interest, visiting relatives (in my case), offers of a bed for the night, and all the whimsical ingredients that go into making last minute decisions to go in one direction and not another. As ever, I will carry my little tent, and expect to use it for several nights, but I am also contacting members of Warmshowers (the hosting website for cyclists) who lie somewhere near my route, and so far I have very kind offers from 4 members of the group to stay the night with them, or to pitch my tent in their garden and share a meal with them. The Warmshowers hosts made my trip through Japan very special two years ago. They each gave me an opportunity to experience Japanese domestic life, share their hospitality, and get a truly inside view of life in Japan. Although the Irish culture is not in any way alien to me, I have a great deal to learn and appreciate about some of the finer detail that make up the foundation of Irish sensibilities and customs. My route this time reflects a slight change of emphasis in my thinking. Although it is an End-to-End ride, the starting and finishing points are quite incidental really. They simply provide a framework for a ride that is not intended to be the most direct route, nor the quickest but, hopefully, will be the most interesting allowed by the timescale of three weeks. So I will be seeing a lot of the west coast and, no doubt, seeing a lot of the famous weather that makes Ireland one of the greenest countries on the planet. It is astonishing how the attention of the long-distance cyclist can be harnessed rigidly to the idea of roaming in far-away places, some exotic, some not quite so, and what lies on or near the doorstep is completely overlooked. 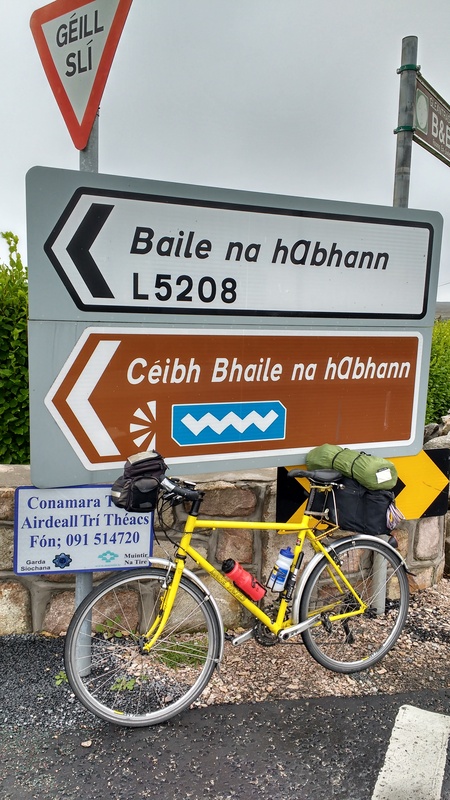 I’m ashamed to admit that I have never cycled in Ireland, and doubly ashamed because, on my mother’s side of the family, I have several first cousins in County Limerick, whom I visit only very sporadically. 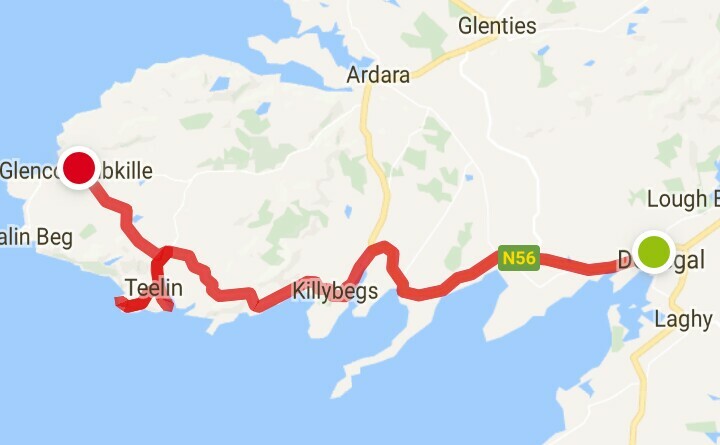 So my decision for 2017 is to right that wrong, and spend three weeks riding the Irish ‘End-to-End’……better know as Mizen Head (in the south west) to Malin Head (in the north)…..or known more familiarly as the Miz-Mal. It is not a huge distance. The shortest route between the two points is about 550kms but, no doubt, I will wander off route and take in some of the west and north-west coast, and probably notch up about 800kms. The first few days will very handily take me in the direction of my relatives in County Limerick, and it will be a huge added bonus that I will be able to spend a few days visiting, catching up with family matters, and celebrating our mutual advancing years. As with every journey I do, I spend weeks absorbing information, reading and listening to podcasts, generally immersing myself in the history and culture of the country (or countries) I’m visiting. Ireland, too long seen as a mere appendage to Britain, is a country with its own Celtic vitality, and it has a rich heritage that is uniquely its own. My reading has taken me through the biography of WB Yeats, some of the short stories of James Joyce, the history of the 20th century and its turbulent years fighting for freedom, accompanied by the stark reality of revolution portrayed in Ken Loach’s film The Wind that shakes the barley. Much still to unearth and anticipate. Watch this space.